Made from organic cow's milk from Straus Family Dairy, Wagon Wheel was Cowgirl Creamery's first foray into developing a large-format aged cheese. The hefty 16-pound wheels went through extensive recipe and maturing tests to find the perfect texture, age and flavor profile. Our cheesemakers exceeded their goals by making a cheese that is desirable both as a reliable cooking cheese and also an excellent choice for a cheese board. Wagon Wheel's rosy-hued rind surrounds a delightfully supple center. Luxurious in its natural state, the paste becomes irresistible when melted. The flavor has a slight tartness balanced with richer notes of brown butter and cream. 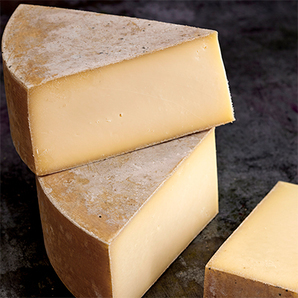 All cheeses made by Cowgirl Creamery are Marin Organic Certified Agricultural Products.